The Young Man Who Was Not a Beggar There was a young man at the begging corner at our intersection on Friday afternoon. He looked as if he was new to the streets – still had clean clothes and his shoes were in good shape. He looked clean, if a bit sweaty. I couldn’t read his sign from where I sat in my big, air-conditioned SUV with the leather seats and moon roof. I scrambled to find some money, but I never have actual cash money on me – just a random quarter or two for the toll and credit cards. I thought: I’m leaving my great job to go home to my nice house with my beautiful family. There will be a roast chicken on the table for Shabbos dinner – and he’s stuck out here in the heat, begging for money. So I drove to the Burger King and bought him some dinner and a soda. Okay, not healthy, which bothered me, but I didn’t think about that until I was driving away from the window! I drove back and gave it to him and wished him luck. I still didn’t get to read his sign so for some reason he continues to stick in my mind. Was he traveling and broke down? Does he need a job? Food? A place to sleep? I kept thinking about him at odd moments all weekend. He wasn’t there when I went past on Saturday or Sunday, so I hope his problem has been solved and he’s moved on to journey’s end. Maybe we should all be wearing a sign. What would yours be? This entry was posted in 7. Inspiration, 9. General and tagged Gastric Bypass, GBS, losing weight, RNY, Roux-en-Y, Thoughts; Health; life, Weight loss, weight loss surgery, WLS; thoughts. Bookmark the permalink. 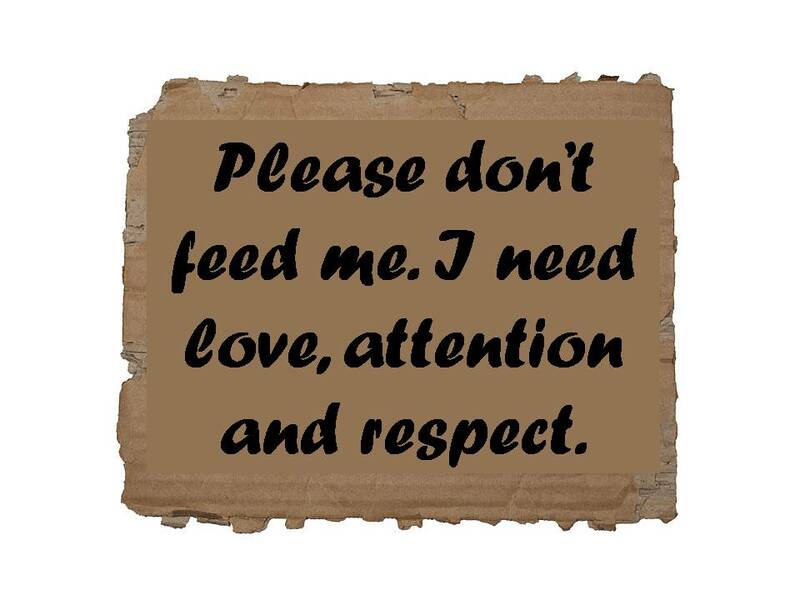 This one truly brought tears…..no matter the ‘issue’ what we all really need is “love, attention, respect”. Dead-on, gal!